Plus, with this gross, gray weather we’ve been inundated with lately (spring — where ARE you? ), it was most definitely a grilled cheese kind of night. The secret? First of all, the bread. Have you tried Whole Foods’ homemade black pepper Parmesan bread? It is ridiculously tasty. They typically just bake it on Tuesdays, but it’s the special bread for the month of May (!!! ), so they’re baking it daily AND it’s cheaper than usual. Double score. Next up: The cheese. I’m a big believer in multi-cheese grilled cheese sandwiches. As in, I think you should use at least two varieties of cheese. So on tonight’s sandwiches, I included both sharp cheddar and Jarlsberg. Yum. Additional ingredient: Tomatoes. 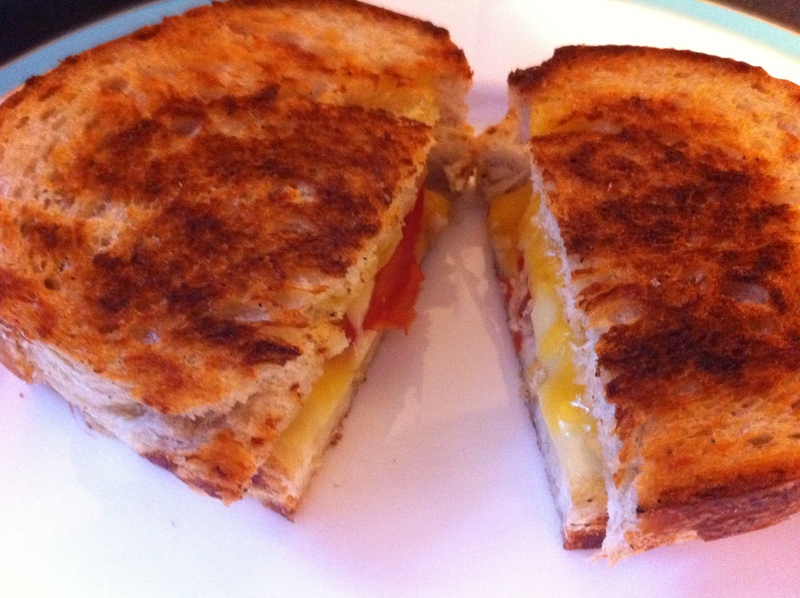 If you haven’t tried a grilled cheese and tomato sandwich yet, please change that. It totally takes things up a notch. So, yeah. Spread coconut oil on one side of each slice of bread. Put the bread coconut oiled-side down in a pan heated to medium-low, add cheese, tomatoes, and second slice of bread on top of the first slice. Cook on each side for about four minutes — and enjoy!